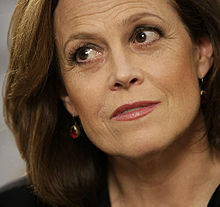 Sigourney Weaver (born Susan Alexandra Weaver; October 8, 1949) is an American actress. She is kent especially for her role o Ellen Ripley in the fower Alien films: Alien, Aliens, Alien 3, an Alien Resurrection. Ither notable roles include Dana Barrett in Ghostbusters an its sequel Ghostbusters II, Gorillas in the Mist: The Story of Dian Fossey, Working Girl, an Grace Augustine in Avatar. This page wis last eeditit on 8 Mey 2018, at 00:42.